One of the best resources available for street rod enthusiasts are the state street rod associations. In just about every state, there are one or more street rod associations. These associations in most cases, are directly connected to the NSRA and support their efforts. These associations provide local, regional, and state street rod shows and other events. Most of these shows provide a wide variety of vendors, displaying their products and services. In addition, many state street rod organizations provide a monthly magazine. 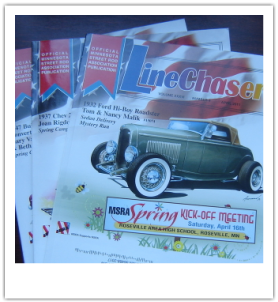 For example, the Minnesota Street Rod Association provides a monthly magazine called LineChaser (See photo) for each of its members. Such magazines offer the street rod enthusiast classified ads, local and state advertisements, technical articles, and a variety of photos showing local street rod club activities.